Is migraine related to vision? Migraine headaches are caused by a sudden change in the level of Serotonin in the brain. This subsequently affects other neurotransmitters and causes changes in the blood vessels in the brain. It is not known what is the exact cause for the Serotonin levels to change, but it can be triggered by specific food or a particular kind of noise, smell or light. As an optometrist, it is reasonable to suspect that somevisual anomalies and/or certain visual stimuli may trigger a migraine headache. Indeed, it may be related to poorly corrected refractive errors, such as longsightedness (Hyperopia), astigmatism and shortsightedness (Myopia).Harle & Evans (2006) suggested that low degrees ofastigmatism and anisometropia are relevant in migraine, and more significantly, higher degrees of astigmatism were found in the group who suffers from migraine. Migraine sufferers often show some sensitivity to light, sound and smell. Some patients with migraine may be hypersensitive to certain visual stimuli, such as pattern glare (or visual stress) which may trigger a migraine headache. This can be treated with individually-prescribed precision-tinted lenses and its most likely mechanism is the alleviation of the patient's cortical hyperexcitability (Wilkins 1994) and associated pattern glare. The effectiveness of precision-tinted lenses for migraine headaches is supported by a randomised controlled trial (Wilkins, Patel & Evans 2002) and the specific colour for precision-tinted lenses can be identified through Intuitive Colorimetrywith IGARD Group in Singapore. Migraine attacks are often recurrent. Common Migrainecauses a persistent and severe throbbing/pounding pain and an attack usually lasts between four and 72 hours. They may feel sick, vomit and/or have diarrhoea, and they may also be sensitive to light, sound and movement. Tiredness or mood changes may be experienced the day before the headache. One in 10 people have an aura which is experienced ten to thirty minutes before the headache (Classic Migraine). Most auras are visual and migraine sufferers would usually describe them as 'flickering lights' around objects or at the edges of their field of vision (Scintillating Scotomas), 'zigzag lines', 'castles' (Teichopsia) or hallucinations. Some migraine sufferers may experience a temporary loss of vision, whilst others may also develop other non-visual auras, such as motor weakness on one side, slurred speech, dizziness, fainting, and tingling or numbness (Parasthesia) of the face, tongue or extremities. Patients suffering from migraine should first see a general physician for their medical condition, but they should also visit an optometrist to ensure that their eyesight is adequately corrected and to get their eyes checked for pattern glare (orvisual stress). 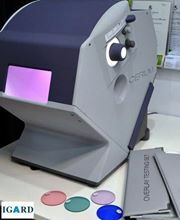 Should there be a need for precision-tinted lenses, the patient should attend an Intuitive Colorimetryassessment. 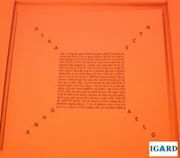 In Singapore, this test can be obtained from optometrists under IGARD Group.